This utility updates the firmware to version 2 and resolves an issue where, under certain circumstances, the clock settings of the DSC-HX5V may be reset when GPS date information is received. Push and hold the Zoom Lever to the "T" side. While continuing to hold the Zoom Lever, push the Playback button. 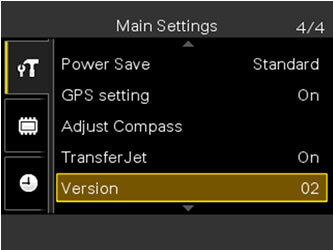 On the camera menu, select "Setup". At the Main Settings menu check the Version number listed. If the version number is 02 or higher, your camera does not need this update. Macintosh® OS X version 10.5, 10.6, or 10.7. Note: The update can only be performed when the remaining battery level is (3 marks) or higher. It is strongly recommended that you use a fully charged battery pack or the optional AC adaptor. WARNING!! This utility is only for use with the Sony DSC-HX5V camera. Do not install this utility with any other model. Performing this update requires a fully charged battery pack (NP-BG1 or NP-FG1), or AC adaptor AC-LS5A (sold separately). WARNING!! Do not remove the battery or disconnect the AC adaptor during the update. Doing so may cause the camera to become inoperable and require service. Download the Update_DSCHX5V2.dmg file to a temporary or download directory (please note this directory for reference). Go to the directory where the file was downloaded and double-click the Update_DSCHX5V2.dmg file. If the version number is 02, the camera firmware was successfully updated.